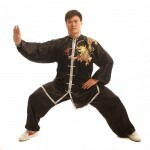 Reeling Silk Exercises (Chan si gong) are a recent development. They were created to assist students of Taiji to understand how the body must move to gain and utilise the unusual strength of Taiji (chan si jin). Understanding how the whole body coils and uncoils, opening and closing, is central to training in Taiji. These exercises simplify the process of understanding into a graduated process. It begins first by training to move one arm / hand using whole body coiling, then the other, then both hands in one plane of motion (e,g front circle). Then a similar progression in a second, more difficult plane (side circle) is taught. Then a combination of both planes in increasing complexity. The list below is provided as a reminder of the fixed feet reeling silk exercises Wang Hai Jun commonly uses in his workshops and classes. Once these are learnt and understood footwork (Bu fa) is added. Again there are increasing levels of difficulty. Stepping includes: side stepping, diagonal stepping, forwards and backwards stepping. The list below is provided as a reminder of the stepping reeling silk exercises WHJ commonly uses in his workshops and classes. As mentioned above, silk reeling exercises are a teaching aid. Any movement or part of a movement from any form can be used as a silk reeling exercise. They can be executed in a wide variety of ways. There are references to silk reeling in many other articles.